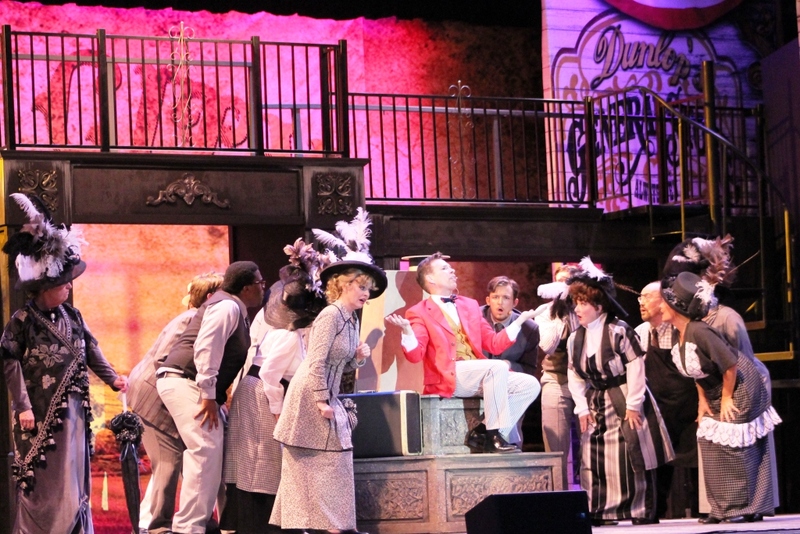 PS Productions' "The Drowsy Chaperone"
PS Productions’ “The Drowsy Chaperone” continued a long tradition of excellent productions at Las Vegas’ very own Super Summer Theater. Each actor performed with full commitment and passion, each song delivered energy and vigor . The creative staging and brisk pace of the show were quite engaging. Impressive performances by Shannon Winkel (Janet Van De Graaf) and Ayler Evan (Adolpho) engrossed the audience. This writer had previously seen Ms. Winkel in “Singin’ in the Rain” playing Kathy Seldon for Signature Productions earlier this year; it was a treat to see her again in a production. Her singing and stage presence were captivating, and she showed her significant range of acting, as well. She also did great justice to the musical direction and tap choreography. Mr. Evan was charming and appealing in his flamboyant characterization of Adolpho. He delighted the audience with the vivacious life he brought to each scene. His physical comedy was hilarious. Indeed, every element of the show was very well done. Costumes were impeccably designed and richly detailed, as a close examination after the show revealed. Lighting was well-designed and executed, the sets were terrific (Lion King posters on the stage-right back wall – yes!) and set changes were smooth. This musical has a fun, entertaining and positive book. It was a terrific choice for a summer theater production. Super Summer Theater has a well-deserved reputation for mounting quality productions, and “The Drowsy Chaperone” splendidly added to this standing. Don’t miss it. 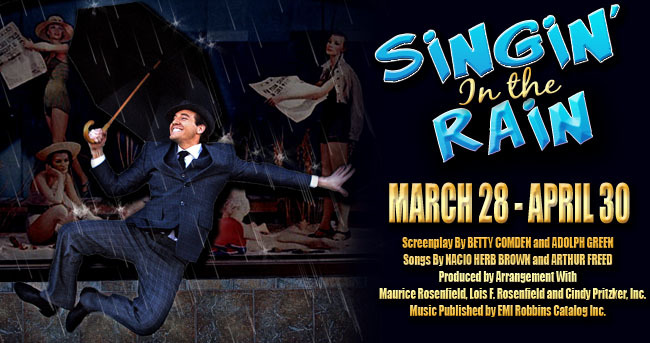 One of America’s most beloved movie musicals was brought to life this month in Las Vegas, complete with real rain, great singing and mostly great dancing. The rain effect, using real water, surely was a difficult technical task to design and run. With the help of UNLV’s Engineering Department students, this production successfully made it rain on cue and with no drainage problems. It added a wonderful dimension to the live production. Although the rain itself was spotty and uneven, it was amazing to see it at all on this small library stage in the middle of a desert. Stage crew and engineering students alike deserve a lot of credit for making it possible. The principal actors were engaging and committed. Evan Litt, as Don Lockwood, brought to life the lead character with style and ease. David McMullin, as Cosmo Brown, was energetic and a very decent tapper. Shannon Winkel , as Kathy Seldon, had an angelic voice that was a treat to hear. Kelly Albright, as Lina Lamont, was spot-on, line for line – a complete resurrection of the original film’s character, in vocal effect, mannerism, and acting. Some things in movies cannot be reproduced on stage. Gene Kelly purposefully experimented with the unique ability of film to capture close-ups, stunts or visual angles that cannot be done live. This show cleverly re-staged some of the movie scenes so the story line worked successfully onstage. One example was Don Lockwood’s getaway from his screaming fans, which in the movie involved Don climbing on top of a bus and jumping into Kathy Seldon’s car. In this stage production, Don escaped on foot and bumped into Kathy at a bus stop. It worked perfectly. Also, in the set-up scene before “Broadway Melody”, McMullin alone tries to explain the concept of the singing and dancing part of their “talkie” movie to studio owner, RF Simpson, which allowed Litt to participate in the “Broadway Melody “dance sequences (in the film, both Don and Cosmo are in the owner’s office, as well as Don being the main character in the dance sequence). McMullin was impressive as Cosmo, especially in the physically demanding “Make ‘Em Laugh” scene, where he sang, launched himself around the set doing physical comedy, and even threw a little contortion into the mix. His acting was marred only by his habit of emphasizing one-liners with a facial grin so pulled back it almost seemed like a grimace. But his energy and projection was, like the rest of the cast’s, fantastic. Choreography by Teresa Martinez stayed true to the style of Gene Kelly’s original choreography, for the most part. The original spirit of numbers like “Moses Supposes” and “Good Mornin’!” was preserved very well. However, there were lost opportunities in the “Broadway Melody” montage number though, when short stops in the music, which were obviously supposed to be used for tap breaks (tap solos) were choreographed as dance freezes. Another problem, perhaps only noticeable to trained dancers in the audience, was the technique of the ensemble dancers, which lacked leg and foot lines and walking style. The use of home-made films to re-enact the vocal-dubbing scenes in the original movie effectively reproduced a very interesting and core aspect of the original film. Huge credit must be given to all the leads for doing what neither Gene Kelly nor any film musical actor ever had to do – sing while they did that Gene Kelly choreography. That is truly difficult, and a remarkable feat – a testament to many, many hours of rehearsal. The finale was the most visually-satisfying scene, with the ensemble and leads all in yellow rain slickers and dancing in the rain – a very pleasing end to the show. Signature Productions gave community theatre a professional sheen.